So, you’ve completed your research, know the exact outdoor extension you want and are just about to contact a Stratco outlet for a quote. Before you begin leveling the site, be warned, you’ll probably need a building permit long before you start shifting dirt!! Permits are usually required for nearly all minor structures, such as a carport, your Stratco outback sunroof verandah, an outdoor gazebo, pergola designs, etc. Furthermore permits are usually the responsibility of the owner and need to be obtained long before any work can be started. It’s also worthwhile to note that the fees for your building permit need to be paid before it will be passed. And there is also the extra cost of the State Government’s Building Permit Levy. There can be a huge difference between the fees charged to lodge a permit, so it’s a good idea to contact your local council and find out just how much extra you’ll need to budget for. Most councils have a reasonably simple building permit application online for you to download. To complete the form you will need to know who your extension company or architect is, and at least have an estimated cost. Building Permits vary slightly, from council to council in what information you’ll need to give them. So you’ll need to go onto your council’s website, call them, or pop into their offices to find out exactly what they require. Information, such as a very detailed plan of the proposed extension, site dimensions, soil test, etc. also need to be lodged when you put in your permit. This can also vary a little between councils, again, you’ll need to contact your local council for a list of what else needs to be submitted. Time taken to pass a Building Permit can range from six days to six months! So maybe when you contact your local council, ask for an estimation for how long it could take for your permit to be passed. Hmmmmmm, sounds tricky doesn’t it……. But, have no fear, most extension companies that handle Stratco products are reputable and should be able to advise you on how to make sure your building permit is lodged successfully. Contact Strong Life Constructions on 03 9310 4455, enquire on our website, or email us marketing@stronglifepatiosandcarports.com.au to arrange one of our friendly team members to visit and quote on any of our range of extensions. Imagine being able to have a verandah with a sunroof inserted into it, how those first Australians of years ago would have envied our inventions. This clever use of our sunroof can provide the best of both worlds, full sun or shade when you want it all with the touch of a button. Sun or shade at your command with our Outback Sunroof. This amazing piece of engineering gives the home owner more freedom of choice with their verandah. The Outback Sunroof has a powerful electric motor that will silently adjust the louvers on the sunroof so you can create the light or shade you require. The clever engineering design is constructed from a series of very durable interlocking louvers that are easily opened and closed with a remote control and create a watertight and sun blocking device on your verandah that is stylish and functional. 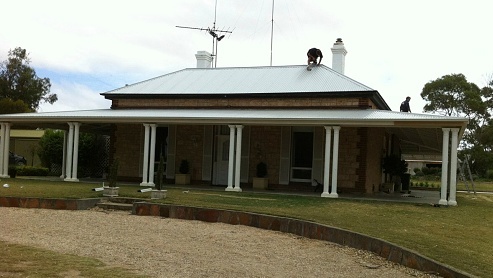 A big plus in having a louvered Outback Sunroof installed in your verandah is its ability to maximise ventilation. When the roof is opened slightly the trapped warm air beneath it is able to escape allowing the natural breezes to flow through. Each louvre has an insulated foam core which helps to block out any surrounding noise and the radiant heat from the sun is no longer a problem. On the days when the weather forecasters don’t quite get it right, you may have opened the louvers to enjoy the sun’s rays and leave your home for a while and the weather turns nasty. The Outback Sunroof has a built in rain sensor which automatically closes the louvers for you so you can leave the house with confidence knowing the washing you left drying under the verandah will not be drenched upon your return! When your Outback Sunroof is being installed you have a choice to align the louvers in one of four different positions to suit your needs and obtain the benefit of the prevailing breezes and the suns orientation in relation to the position of your home. This maximises your comfort and reinforces the flexibility of your Outback Sunroof. 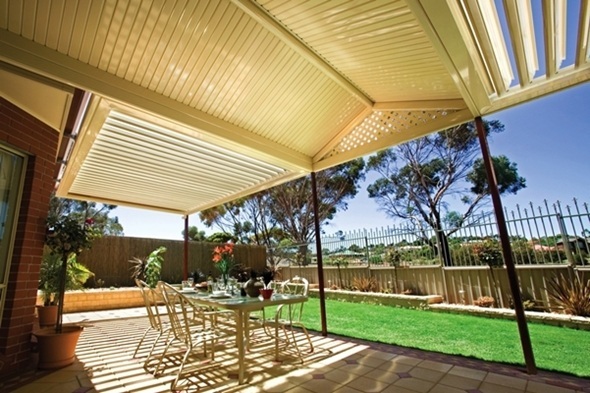 You will find our Outback Sunroof so versatile and is an ideal partner to a range of shade coverings including verandahs, awnings and pergolas to further your outside entertaining comfort. Next week…we’ll be taking a look at the Cooldek verandah, which utilises stylish insulated panels to significantly block out heat and noise. Available in a range of thicknesses, the thickest panels deliver an insulation rating of up to 2.8. A great choice if you are looking for added comfort and protection from the suns relentless heat. The insulating properties of the Cooldek also make it ideal to help block out surrounding noise – you can even hear yourself talk in the pelting rain! With summer fast approaching, so too are the hot dry Australian days. For many of us, we have peace of mind that we can simply flick a switch and turn on a supply of cool air into our homes, but for many until the 1980’s air conditioning was unheard of. With electricity also not widely available until the late 20th century especially in rural Australia, its citizens needed to be very inventive in order to keep their cool. Shade was imperative for living comfortable and even those homes that could afford electricity it was still very expensive. This need for shade was the reason that Bullnose verandahs became normal for a large proportion of Australian homes, what better to shade the windows and outdoor patios of a property. The unique look of the Bullnose verandah has made this a symbol of houses in this country and because of the low profile aspect of this design it is able to provide significant shade relief from the relentless Australian summer sun. The shade provided by this verandah allowed families the freedom to enjoy the outside area underneath it and this began the tradition of the great Australian outdoor barbeque. The clever design of the original verandahs have been improved greatly since the early days. Today with improved technology there are many more innovative options available to every home owner. Bullnose verandahs not only provide necessary shade but can be made in such a way that precious light is not blocked from the home. Windows that are shaded can remain open and this allows a good airflow throughout the home, and on rainy days when windows were left open and the rain entered the house that is no longer a problem when the house is protected with a verandah. In effect not only is the verandah a thing of beauty, it is a major part of reducing unwanted heat into the home during the summer months, therefore reducing the rising cost of energy bills. It also provides protection from rain damage during storms, allows the area beneath it to be used in all weathers and greatly adds value and style to any property. Have you subscribed to the Strong Life Home Improvement Blog? Each month we introduce you to many great ideas that are available to the modern home owner. Check out our blog here on Electronic Sunroofs. If you would like more information, or to request a FREE Quote on any of the Strong Life Patios & Carports products simply click here, or call 03 9310 4455 Today. The unique look of the Bullnose verandah has made this a symbol of houses in this country and because of the low profile aspect of this design it is able to provide significant shade relief from the relentless Austrlaian summer sun. The shade provided by this verandah allowed families the freedom to enjoy the outside area underneath it and this began the tradition of the great Australian outdoor barbeque. The clever design of the original verandahs has been improved greatly since the early days. Today with improved technology there are many more innovative options available to every home owner. Bullnose verandahs not only provide necessary shade but can be made in such a way that precious light is not blocked from the home. Windows that are shaded can remain open and this allows a good airflow throughout the home, and on rainy days when windows were left open and the rain entered the house that is no longer a problem when the house is protected with a verandah. Our quality Verandahs in Melbourne are an excellent area for relaxing and entertaining and also improve the visual appeal of your home. The right verandah designs in Melbourne are often what give people a first impression of your home, so it is important that they look their best and reflect the style of your home. Combine our talented verandah builders in Melbourne with a few of your simple ideas you can make your verandah a reflection of your personal tastes to create a relaxing and attractive environment. Our quality verandahs in Melbourne are perfect to create a space based both on personal taste and the space available to you. If you have limited space place one or two items of furniture, our verandah designs in Melbourne are perfect for both small and larger spaces. If you have more space to play with you can add more but avoid creating a clutter or difficult to navigate areas. Choose light coloured furniture to create a sense of space or dark to create a cosier environment. Our Quality Verandahs in Melbourne are Fun to Decorate! The only limit to veranda decoration is your imagination! Try adding plants, portraits, vases, wind chimes and see what you like and what matches the aesthetics of your home. Our Verandah builders in Melbourne have custom designed your Verandah to match your home and suit your tastes, so decorating should be fun and easy to do. At Stronglife Patios and Carports Melbourne our verandah builders in Melbourne will design and install quality verandahs in Melbourne, completed on time and within your budget. For a FREE QUOTE on our quality verandahs in Melbourne or additional advice Call Stronglife Patios and Carports on (03) 9310 445 today!